At the IntLawGrrls-sponsored "Women and International Criminal Law" roundtable this Friday, I'll have the privilege to hear comments on the latest of my research regarding women who played roles in the Allies' Trial of the Major War Criminals, as well as subsequent trials that the United States held after World War II at Nuremberg, Germany. The research owes much to IntLawGrrls' alumna Diane Orentlicher, now Deputy, Office of War Crimes Issues, at the U.S. Department of State. She dedicated her work on the blog to "Beatrice," the presumed name of an unremembered woman who prosecuted defendants at Nuremberg. Eventually, Diane determined that any number of women might have been "Beatrice." The most likely candidate was "Ceil" Goetz (above right); the quest for her and her sisters at Nuremberg first was explored in my "Women at Nuremberg" series of blog posts. 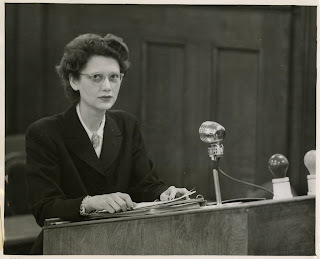 My roundtable essay, Cecelia Goetz, Woman at Nuremberg, tells more about Goetz, an American woman who turned 30 at Nuremberg. Included are not only details on how and why she became a prosecutor in the Krupp trial, but also a life story marked by many “first woman” chapters -- on the law review at New York University School of Law, at the U.S. Department of Justice, and, after Nuremberg, in the federal judiciary. This essay follows upon another overview, "Portraits of Woman at Nuremberg," published recently in Proceedings of the Third International Humanitarian Law Dialogs (Elizabeth Andersen & David M. Crane eds., 2010). "Portraits" places women at the trials within the context of social developments during the post-World War II era. Mentioned are women who were defendants, journalists, or witnesses; however, the focus is on women, mostly Americans, who served as prosecutors at Nuremberg. Among the latter was Sadie Arbuthnot, depicted at left in a photo recently discovered in Harvard Library's digital trove. Later a judge in the United States' court system in Germany and after marriage a lawyer at NASA, Arbuthnot too was a woman at Nuremberg.